Several governmental and non-governmental organizations are involved in social reformation activities. Youth clubs, women groups, mothers' group etc are working at local level. Many individuals are also contributing. Various bodies of VDC and municipalities have their own programs. It is everyone's responsibility to cooperate with them. The following table shows the main non-governmental or organizations working locally in Rasuwa district. 1. Lila Paudyal, Manager of Annapurna Women's Community Organizations in Jutpani, Chitwan says: "We women have become the police in this village as far as card-playing is concerned. We have been very active in wiping out gambling from the village. The children used to spend money given to them by their parents for some family expenses in the gambling dens, often lose and not come home. The women in our group started visiting these dens and starting tearing the playing cards. We urged the Ward Chairman and the police to intervene. In the beginning, the men tried to cover up and make us seem unnecessarily meddlesome. Ultimately, the authorities saw that we had been right and clamped down on the offenders. The police thanked us for our campaign." 2. The women in Benimanipur VDC, Nawalparasi, have achieved a lot of success in battling and gambling from their village. The men are forced to hide when they pick up the bottle or the pouch, officials in the VDC say. The women of Shanti Samuha even posted notices all over the VDC urging people to help in their advocacy against alcoholism and gambling. Below is what one of the members, wives of a reformed alcoholic has to say of her 'reformed' husband. "....Now he's a totally different person. It must have been the social pressure...it must have been the awareness messages that we got through the programme. My husband has changed! Thank You VDP!" Dalits who were displaced out of Bungadobhan Syaula village of Baglung due to political reasons and living in the district headquarters have been rehabilitated with the joint efforts made by Jagaran Media Center, Federation of Nepalese Journalists and collective Campaign for peace. With their property formerly confiscated back, 50 dalit families are now leading a normal life in areas in which they have struck their roots for generations. 'Aama Samuha' ('Mother Groups') are gaining popularity in the field of social reformations and community in the western Nepal about 2 decades ago. Comprised of adult women these groups perform a wide range of functions such as general community welfare, health education and support, income-generation, money-raising etc. Many donor agencies are eager to distribute their aid through these groups. Hundreds of Nepali organizations both governmental and nongovernmental are working in the field of social reformations. The following table shows some of those NGO's along their respective activities. 1. Child Workers in Nepal Concerned Centre (CWIN) Working for the conservation of child rights and fighting against child labour exploitation. 2. Informal Sector service (INSEC) Protecting and promoting human rights. 3. Nepal Forum of Environmental Journalists (NEFEJ) Helping environmental protection and development. 4. 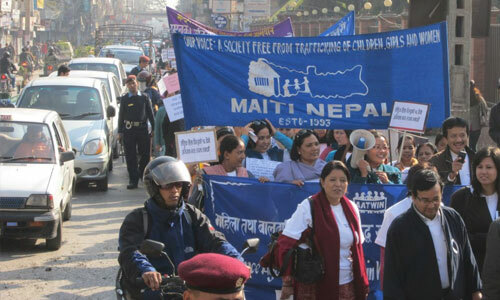 Maiti Nepal Working against girl trafficking and women exploitation and helping victims in their rehabilitation. 7. Backward Society Education (BASE) Creating an explosion free society through awareness raising and skill development in rural areas. 8.. Communication Corner Providing technical knowledge, research, services, radio programme production training and media consultancy. 9. Gurkha Army Ex-Servicemen Organization (GAESO) Working for the welfare of the ex-Gurkha British servicemen. 10. Eco-himal Helping to raise the living standard of people living in Himalayan region. 11. Sancharika Samuha (SAS) Developing gender sensitive media. 13. Himalayan Project Working towards promoting education and culture in remote areas. 14. Health Net Nepal Serving the Nepalese health community by providing affordable Internet service, access to health information, and technical support for several regional information-sharing initiatives. 15. DidiBahini (Gender equality in Nepal) Working towards achieving equal involvement of men and women in all development activities. Youth clubs, women groups, mothers’ group etc are working at local level. Aama Samuha’ (‘Mother Groups’) are gaining popularity in the field of social reformations and community in the western Nepal about 2 decades ago. Why does the women of Nawalparasi thank VDC? The women of VDC thank Nawalparasi thank VDC because of VDC their husband reformed. Their husband quitted alcohol and became good person. List out the programs of FPAN in the field of social reformation. Creating awareness about reproductive health issues and problems. What is the status of Dalit community in your community? Do you notice positive change toward Dalits? Dalit society has been classified as the lower group in our society. Society is changing rapidly and a lot of positive changes are taking place because of which people are changing their attitude towards Dalits or maybe due to certain laws, people are not discriminating Dalits. Dalits are been given more propriety in many sectors and I think this is one of the positive change which I have noticed. Why is mothers' group gaining popularity these days? Mothers group is gaining popularity these days because these groups perform a wide range of functions such as general community welfare, health education and support income-generation, money-raising, etc. Our society is not free from social problems. Write any three measures to be free from those social problems. a. Education should be provided to all. b. Awareness programme should be conducted in the places where social problems are rooted. c. Strict laws should be made and executed. a. It conducts awareness programme on several burning problems. b. It launches literacy programme for children, women, adult and old. Make a table of social organizations working in your district and their work. Human Development and Rural Development Centre To bring sustainable development in the life of poor and low class people increase in come and protect their human rights. Sustainable and Proper Development Academy To make Karnali Zone self-reliant, socially justifiable and equal by retaining it from hunger, social inequality and political helplessness. Maya Sadan (Home) To provide welfare and encourage orphan, disabled, abandoned, destitute and risky children. Human Culture Development forum To restore peace and bring development in human beings through respect, development and promotion of determined human tendency of transformation. How was the tradition of mother's group started? Write on the basis of the information given in the text and asking the people who know it. Indeed, mother's groups have played very important role to eliminate social problems. The beginning of mother's groups for the first time started from Gurung communities of Western hills two decades ago. The man have been out to work, the women have been united and involve in various works. Slowly it has taken the shape of organization and it has involved in social works. It has extended Nepal-wide. Even women have started to fight massively against theft, robbery, different social problems. At least, Gurung women have developed the trend of being united. Go to local club or organization and prepare a report after asking the official of that organization the following curiosities. It has prohibited drugging and selling on alcohol and gambling. It has conducted awareness programme on health. It has run, skill base training and sports programme. It has aimed to do people's participative physical development. Make a table of the names and the works of social organizations working in your district? On any one of the 15 organizations collect information about their details and write a short report. HealthNet Nepal is a non-governmental organization(NGO) that serves the Nepalese health community by providing affordable Internet service, access to health information, and technical support for several regional information information-sharing initiatives. The user of HealthNet Nepal is health workers from several prominent health and medical facilities, university department, and non-governmental organizations. HealthNet Nepal was established in partnership with SATWLLIFE, a non- governmental organization based in Watertown, Massachusetts whose mission is to combat isolation and information poverty among health professionals throughout the developing world. Name any national level organization working for social reform. What sorts of works are done by NGO's? Collect the works of the organizations published in different newspapers broadcast on radio or TV and prepare a description of its work. - To rehabilitate the victims of girls trafficking and domestic violence. - To monitor strongly in border area where girl trafficking takes place. - To create awareness programme on girl trafficking and domestic violence. - To work on human rights. - To find out and study on the activities of violation of human rights. - To inform and make the state aware of the violation of human rights. - To unite the poor. - To assist economically for the income generating programme. - To study, monitor and evaluate to such groups. - To raise the voice against gender discrimination. - To study and investigate gender discrimination. - To create and conduct awareness programme against suppression and violence against women. In Nepal several social organizations have been emerged to give services to the people. But their intension is to earn money. Suggest such organizations for the works they have to do. Write in points. Nepal is a developing country. In developing countries like Nepal, there will be several non-governmental organizations, so there are many in Nepal too. They are BASE, INSEC, NEFEJ, NLA, Health Net Nepal, Didibahini etc. These organizations have been working in various sectors of Nepal and thus providing a wide range of contribution for social reform. Although they are working for people's betterment, they concentrate for earning. These social organizations get much more financial support from donor agencies. However, they do not work even a ten percent. Nominally they are working but for they own benefits and personal matters. Which one of the following is not the social organizations working in Rasuwa district? Which club conserves Buddhism and environment? Which club provides training on short term skill and employment generation? Which club provides training to jounalist? Which group came into existence in gurung community in western Nepal? What is the fullform of CWIN? What is the fullform of INSEC? What is the fullform of NEFEJ? What is the fullform of LWF Nepal? What is the fullform of CVICT? What is the fullform of BASE? What is the fullform of GAESO? What is the fullform of SAS? What is the fullform of NLA? Which of the following organisation promotes education and culture in remote areas? Any Questions on 'Roles of Local and National Level Organizations in Social Reforms '?